Sea vegetables?! Are you kidd’n me? That sounds disgusting! Well, I thought the same until I tried this. Believe it or not, this dish always goes first at our pot lucks! 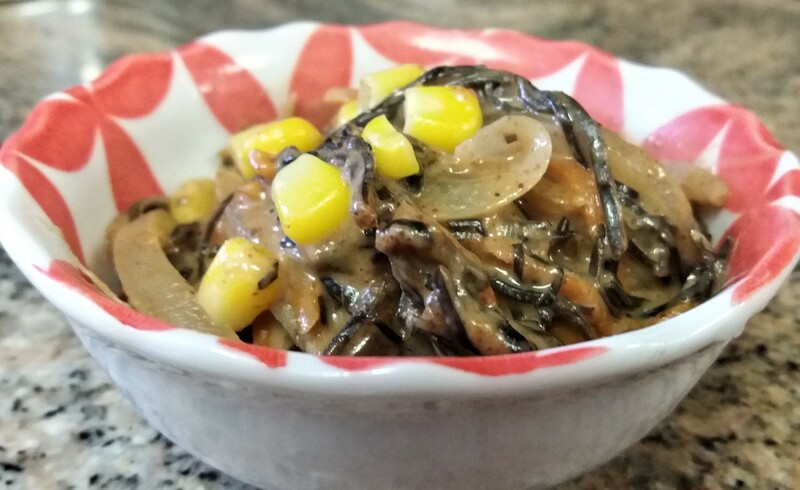 Arame is a great for people not familiar with eating sea vegetables. It has a sweet taste without the strong seaweed flavor. This dish provides great nutrients and is a terrific pick-me-up and tastes great to boot! Heat water or apple juice in a skillet. When hot, add onion, pinch of sea salt and sauté until tender. Add carrots and sauté 1 minute. Discard the arame soaking water and layer the arame on top of the carrots. Add fresh water or apple juice to skillet to steam. Cover and simmer 30 minutes. Add shoyu. Add corn. Simmer an additional 5-7 minutes and mix well. Add the diluted almond butter, mix through, and simmer 2 more minutes. DEVOUR! This should serve 4 people and it will keep for several days.